​Hope to see you at noon today for our 3rd Quarter Awards luncheon! Nine students who will be representing our school at the Interschool Speech meet tomorrow in Bothel will be presenting today right at noon. During lunch, which will be served about 12:20, we will role slides from the Spring Break Italy trip taken by several of our staff and students. Following that, we'll present our quarterly awards. Today is the last day of third quarter, and report cards will soon be headed your way. 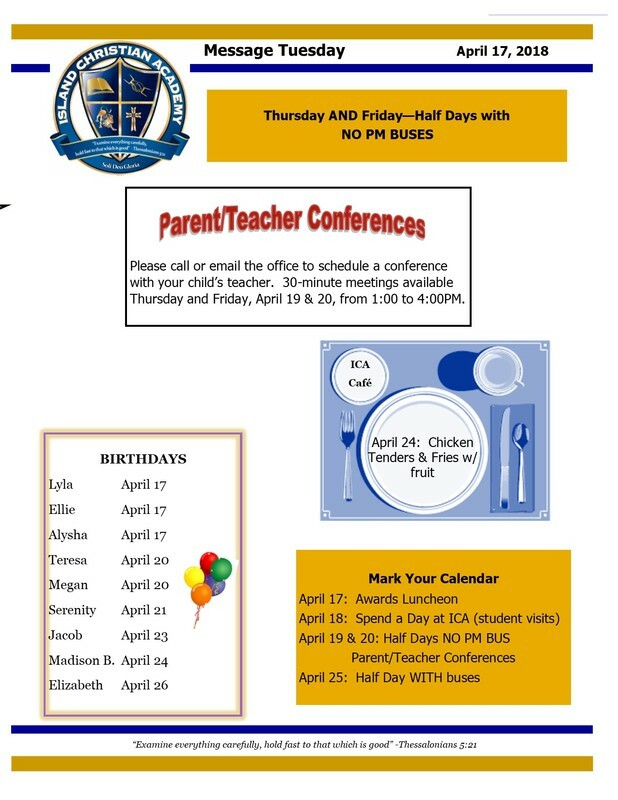 We encourage all parents to call soon to reserve a time for parent teacher conferences (April 25-26) so you can learn how best to help your student finish the year strong. 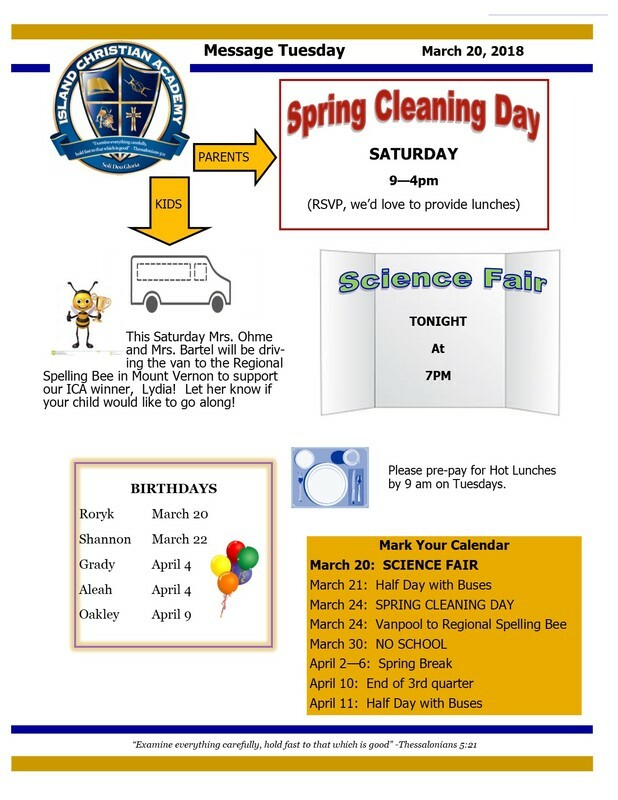 Spring Cleaning Day: This Saturday, April 13 from 9-1 pm we will be having a school-wide clean up day. 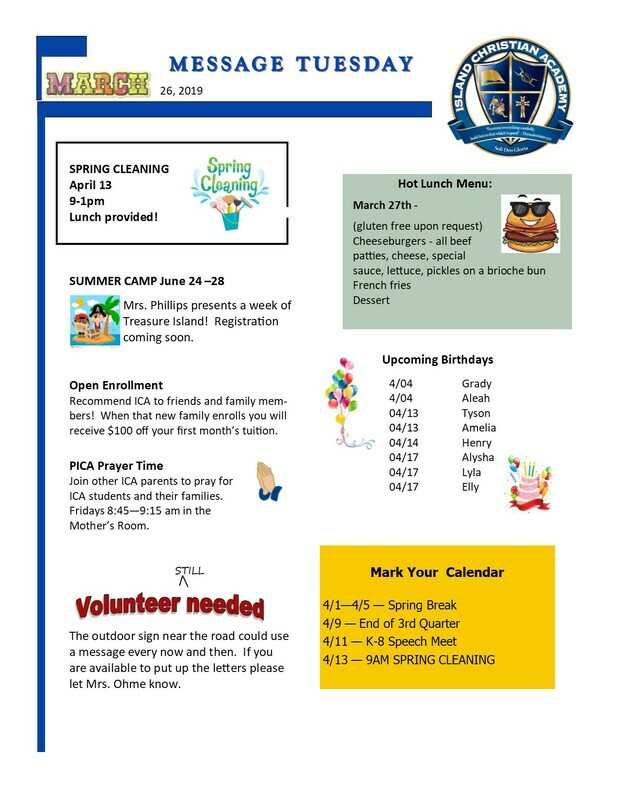 This is a great time to "clean up" any volunteer hours you may have left for this school year. 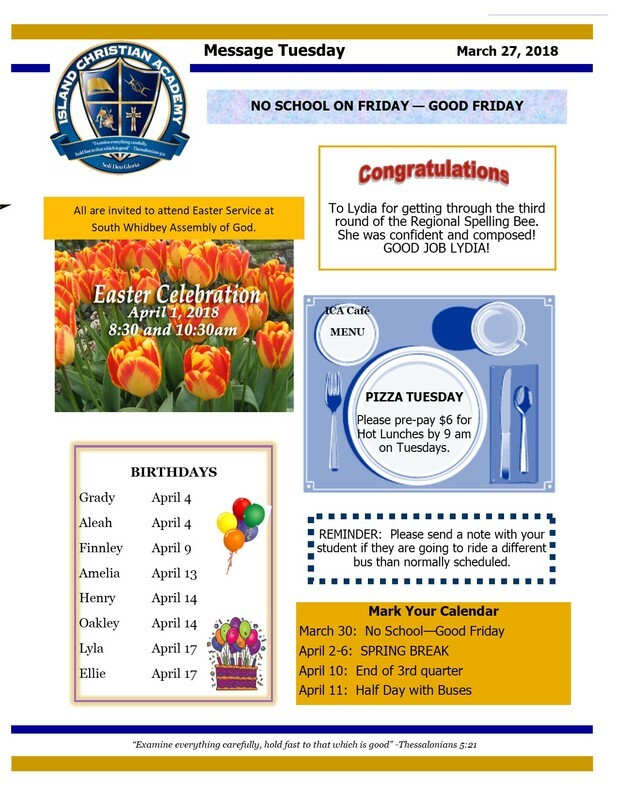 Lunch is provided, so please call or email the school office to let us know how many are coming with you. Hours can be earned for any family member who attends and helps out! Any volunteer hours not completed will be billed in May. 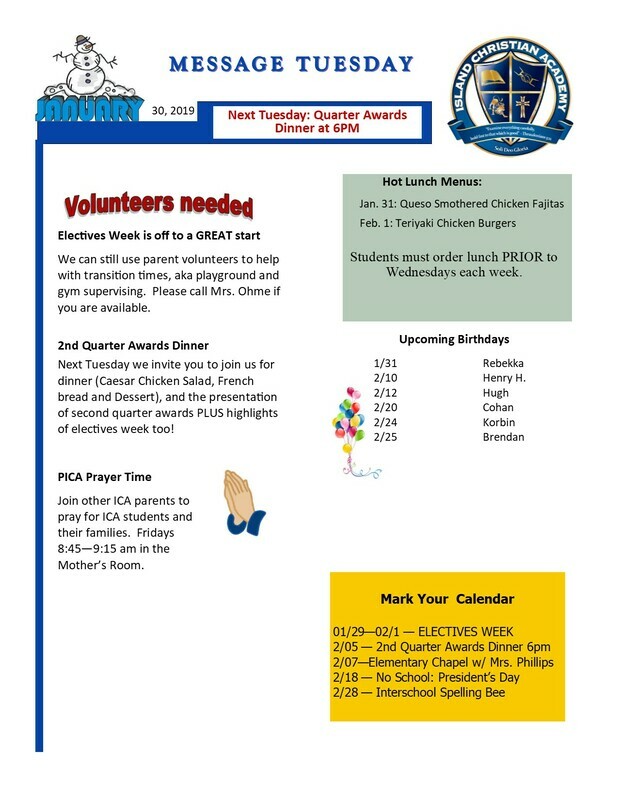 3rd Quarter Awards lunch: Next Tuesday, April 16th, parents are invited to come for lunch (12:00 noon) and join us for our 3rd quarter awards assembly. The band/ensemble will be performing, and we will hear recitations from some of the winners of this Thursday's speech meet. Today is the last day of third quarter, and report cards will soon be headed your way. We encourage all parents to call soon to reserve a time for parent teacher conferences so you can learn how best to help your student finish the year strong. 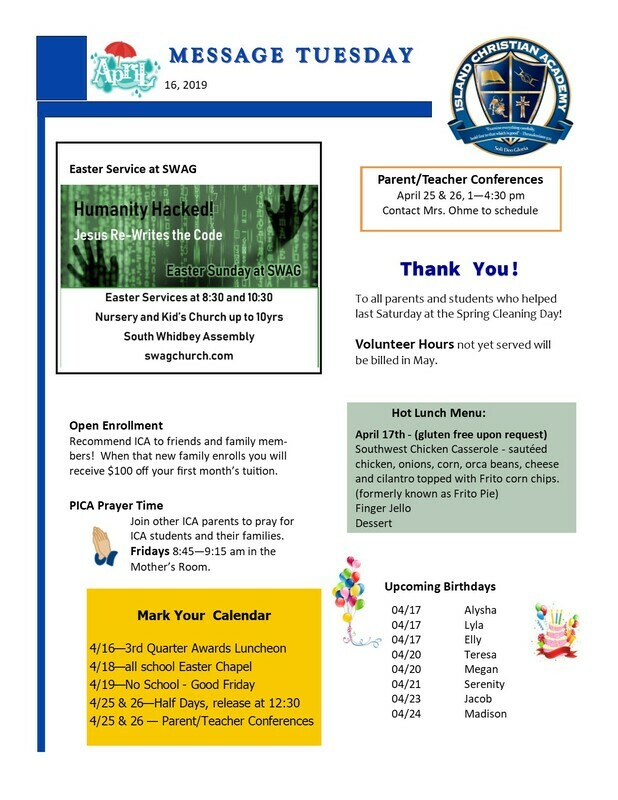 3rd Quarter Awards lunch: Next Tuesday, April 16th, parents are invited to come and eat lunch (12:00 noon) and join us for our 3rd quarter awards assembly. The band/ensemble will be performing, and we will hear recitations from some of the winners of this Thursday's speech meet. ​Thank you so much for those who have taken the time to re-enroll for next year. It it truly helpful in at least getting a feel for how to plan for staffing needs next school year, which will be here before we know it! was awarded 8th place at the Regional Scripps Spelling Bee! This year for last week's History Fair our students went above and beyond expectations! It was fun to listen to many of them express passion about the person they studied. The chance to perform brought out some latent acting talent that can now be nurtured. The feeling of working hard and completing a difficult but worthy task is a joyful gift many students will carry forward with them. 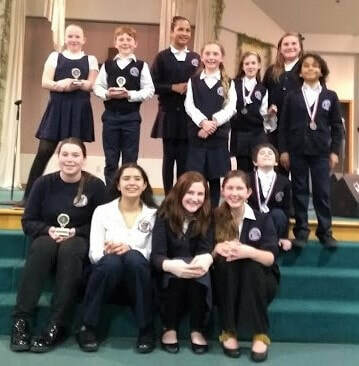 In each age group, the following received the highest points for their combined score in presentation, costume/backdrop/props, knowledge of subject, and research paper. ​Wow! Your students have outdone themselves with this year's presentations. 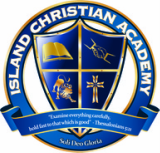 We look forward to having friends and family here on campus this evening from 7-8 pm to hear and see the ICA Wax Museum 2019. This is a different fair from either art or science fair and as such requires a little different protocol for this evening. 2. Every age level has memorized a speech or facts (1st and 2nd grade) about the people they are portraying. As a courtesy, please listen to their entire speech and then if you choose you may ask them questions. Students will answer you while remaining "in character". After answering your questions they will launch into their speech again. 1. Although all judging rubrics are basically the same, the students have been judged within their age group only and have developed their projects according to the criteria given by their classroom teacher according to their grade level expectations. 3. Each student has spent time and effort digging deeply into a topic of their choice. Many of them have discovered the joy of learning for the sake of learning. One life lesson that we all need to learn, and that we are giving opportunity to learn at an early age here at ICA is that comparison with others has the potential to steal away your joy. As you speak with your students about their experience today, it may be helpful to lead their thoughts in this direction: Have joy in what you have learned, share it with others, and find joy in what they have learned. A healthy mindset looks at other people and says, "Wow! That gives me an idea for the next time I do a project." Each of our students has developed skills in some areas and not in others. Help them to see where their skills are developing and where they are already strong and can capitalize even more. Thankfully the snow and sickness seem to be waning and I am expecting the fresh smell of sunshine to be in the air from here on out! History Fair is all the talk this week. 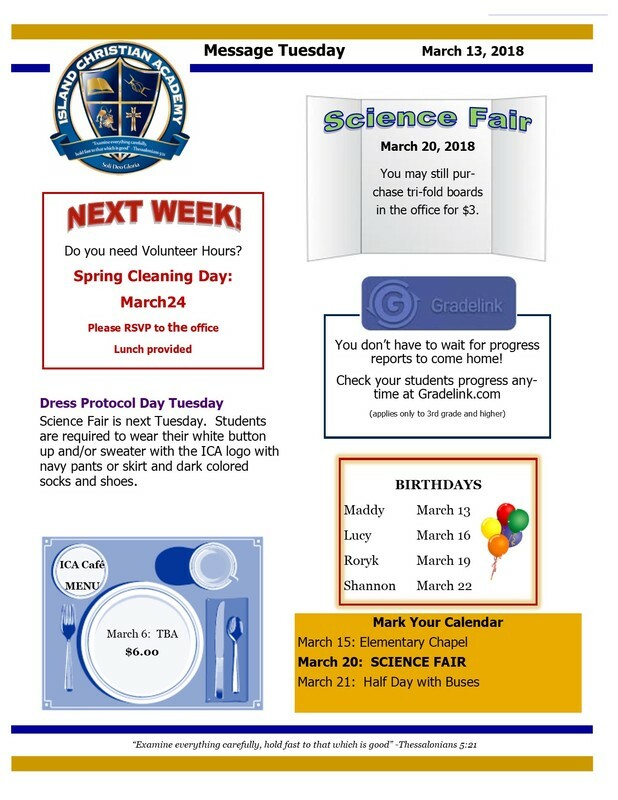 Many projects are due before the end of this week so students have plenty of time to practice their presentations over the weekend. You are invited to come and see the characters and observe some of the presentations next Tuesday evening from 7:00-8:00 pm. Having conducted such an in-depth study of a person in history, I believe your student will carry the memory throughout their lives. When our son, Caleb was in 7th grade, he studied the hobo culture for history fair here at ICA, and learned to play his new, never-used guitar and played and sang (albeit reluctantly) an old hobo song as a part of the performance . Of course he had his tin can out on display along with his hobo soup, and several people dropped money in on their way by to encourage the act. Now at age 21 he regularly leads singing for various gatherings of people with his guitar, and I tease him that he was a professional from his very first gig. 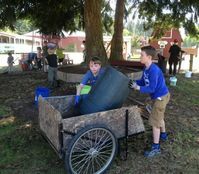 You never know the impact a history fair project may have on your child's future! National History Day is an annual national competition where students all over the United States do exactly what our students are doing next Tuesday. To get a bit more vision for the end product we are hoping for, you can watch the National History Day junior performance first place here. 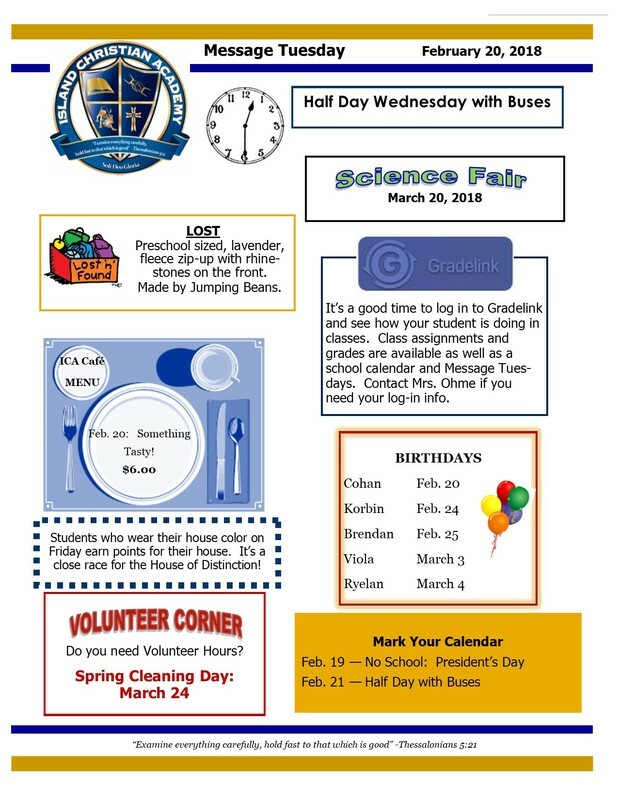 ​Thanks for those who have already signed on to Gradelink to re-enroll for next year! I'm hoping everyone who is planning to re-enroll we be able to do so by the end of the week. Every now and then I come across something in current kid's culture that is worth passing on. Maybe you've heard of the Momo Challenge, which has been reported as a possible threat to students who play on-line games, including games for young children. It was talked about quite a lot last summer, but seems to have resurfaced in the last couple of weeks. Attached is an informational sheet that helps understand what to watch for to help your children avoid the threat. Whether or not the Momo Challenge is real or simply perpetuated by social media, parents do play a big role in protecting their children from very real threats in cyberspace. I encourage you to take advantage of parental controls on devices and monitor computer use, even keeping computers in common areas of your home. May you have discernment and wisdom as you go about the challenging job of raising kids in a world of technological potholes! Here is another interesting article on one of those many potholes. ​Just one week to re-enrollment! 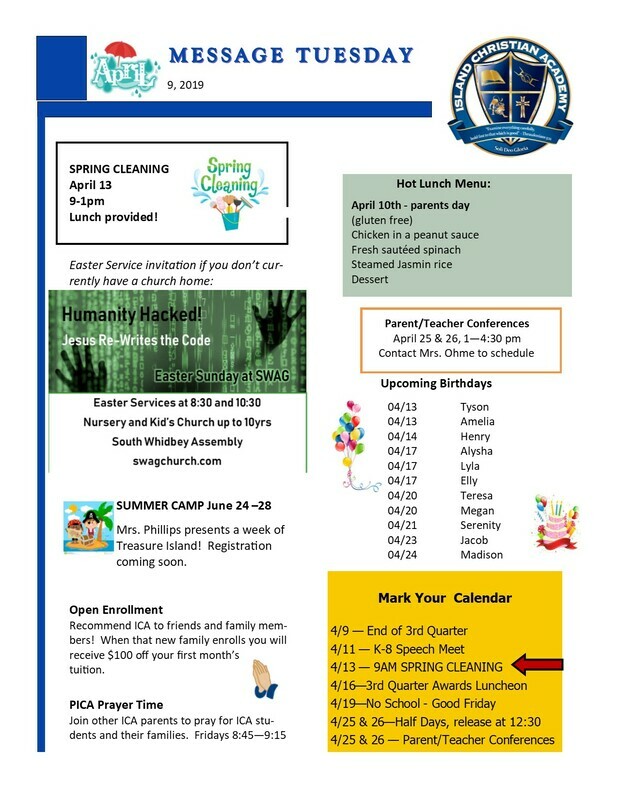 I'll send out an email toward the end of the week with more information regarding the coming school year. I may sound like a broken record, but it really does help with planning for next year if you are able to let us know if your family plans to be back in the fall. Thanks! Favor to ask: I promise this isn't a homework assignment, but it may feel like it. It's different than homework because it's optional! I am currently teaching a junior high Bible class, which is one of my favorite classes of all time to teach. Students at this stage are processing some pretty deep things about life, our culture and faith, and they have lots of questions - which I love helping them find answers for. Because I know everyone one of them will be making a decision in the next few years as to whether or not they will choose to pursue a relationship with Jesus, I thought it might help them in their processing to hear from some of you as to how faith has been a part of your life. If you are a person who has chosen to follow Jesus, would you mind taking a minute to write out answers to a few questions? Alternatively, if it is easier, you might send me a brief video. Here are the two questions: Why did you decide to become a Christ-follower? What do you think is different in your life because of that decision? 1 Peter 3:15 says "Always be ready to give an answer to anyone who asks you to give the reason for the hope that you have." I'm asking I think this could make a difference for our students! Thanks in advance for considering the offer! ​As we say goodbye to the last lingering piles of snow, we also hopefully welcome a nice calm routine for awhile! In case you are wondering, we will not tag on days in June to make up for the snow days. We have extra hours built in to our schedule, so we we are still above the state required minimum for private schools. So go ahead and plan your school's-out get away! 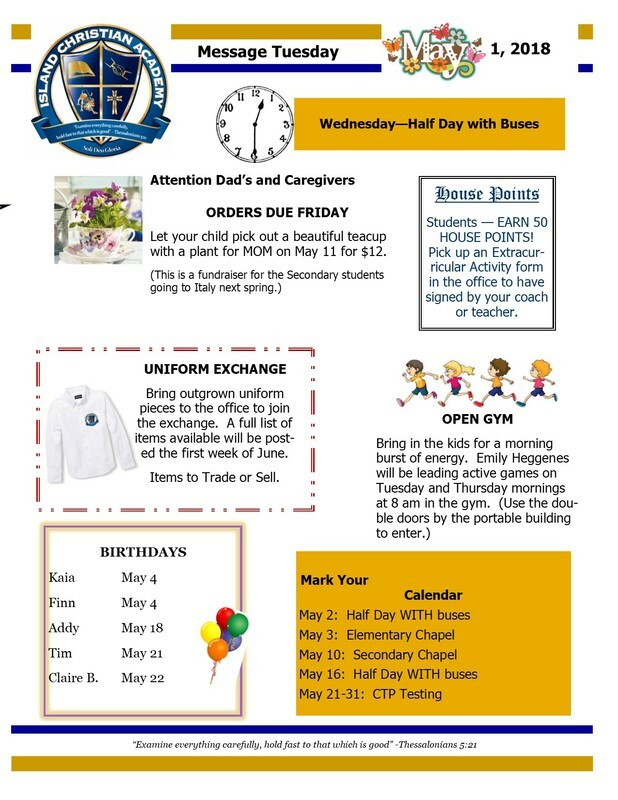 The last day of school is still planned for June 13th barring any unforeseen events. Walking through the hallways, it's easy to find a smiling face this week. Every class is participating in new and unusual learning opportunities. Some are learning how to cook eggs, candy, or bread. Others are making music in choir, ukulele, guitar, recorder or chapel band. The artists are experimenting with rock painting, collages, Electric signs, up-cycled boxes or Chinese calligraphy. To get bodies in motion, we have volleyball, rock climbing, zumba, Taekwondo and yoga. The historians get to follow the steps of the Oregon trail, learn mountain man skills or how to be a knight. Then there are classes for paper weaving, kite-making, sewing, and bullet journaling... Literally something for everyone. It is an exhilarating week for the students, although somewhat exhausting for the staff. We are so grateful for everyone who has volunteered their time and resources to make this week happen. 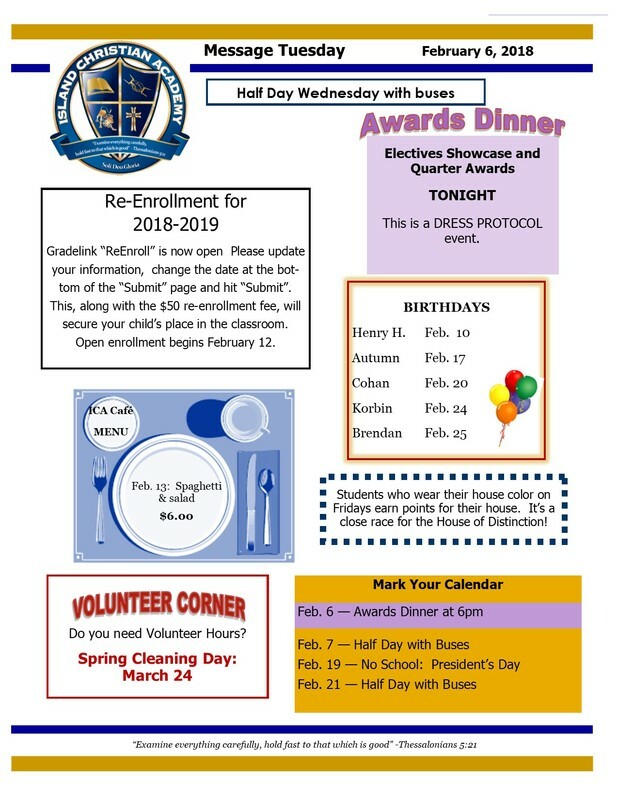 All are invited to the Electives Week Showcase and 2nd quarter awards meal next Tuesday evening at 6 pm. Chicken Caesar salad is on the menu. We hope you can join us for this joyous event! The School Championship Spelling Bee (grades 2-8) took place today. Even greater than the benefit of studying and learning new words for these students is the opportunity events like the spelling bee provide to practice focusing under a bit of pressure. It's a skill that is useful to all of us at some point in life, and this seems to be a low-stakes chance to build that muscle. Congratulations to our top spellers for today and for every student who took the time to put a bit of extra effort into spelling this month! Bailey will represent our school at the Regional Scripps Spelling Bee March 23rd. Go Bailey! The top two spellers from each grade will advance to the School Championship Bee, which is next Tuesday, January 22nd at 2:00 pm in the gym, and to the Inter-School Bee which will be at Cornerstone Academy in Monroe on February 28th. 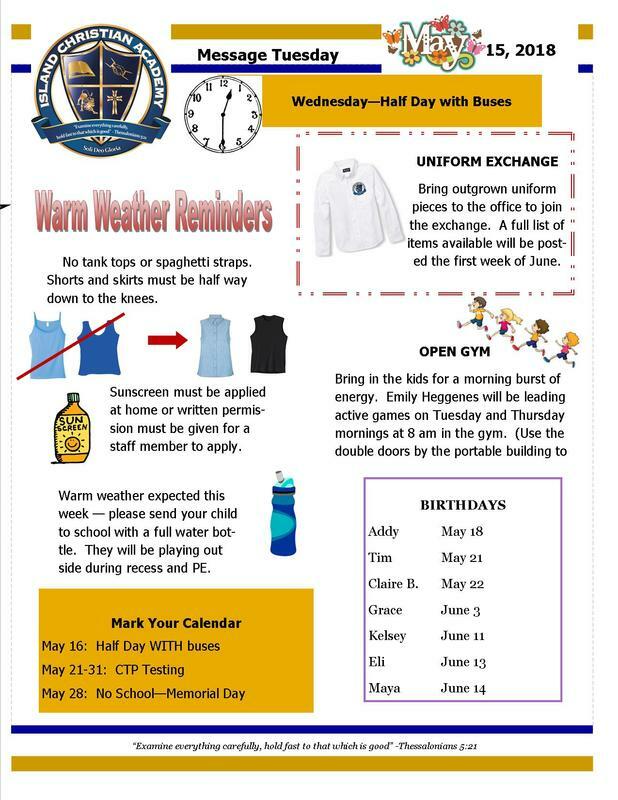 Next Tuesday, the 22nd is a dress protocol day for all students. Sorry for not communicating that clearly for this week – our mistake. 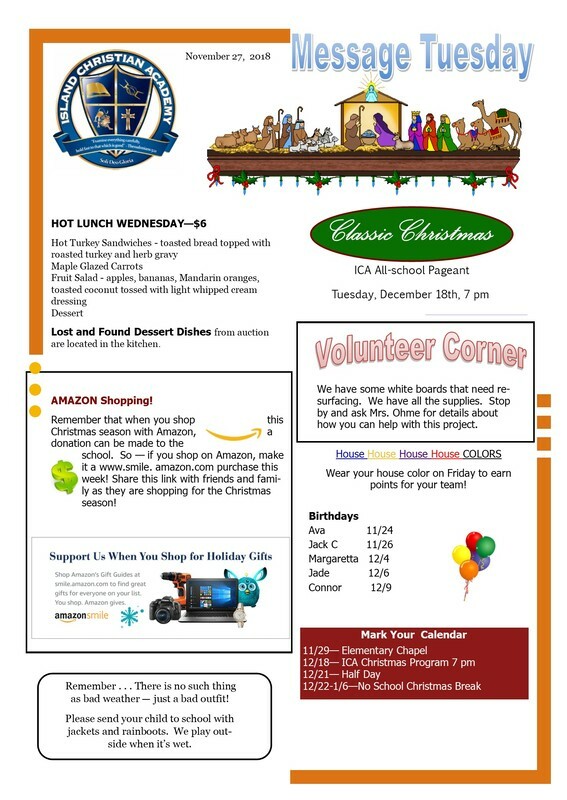 Quest Club: The Parents of ICA students (PICA) group will be helping me present an event this quarter that is sure to bring joy to the students who have worked toward it. 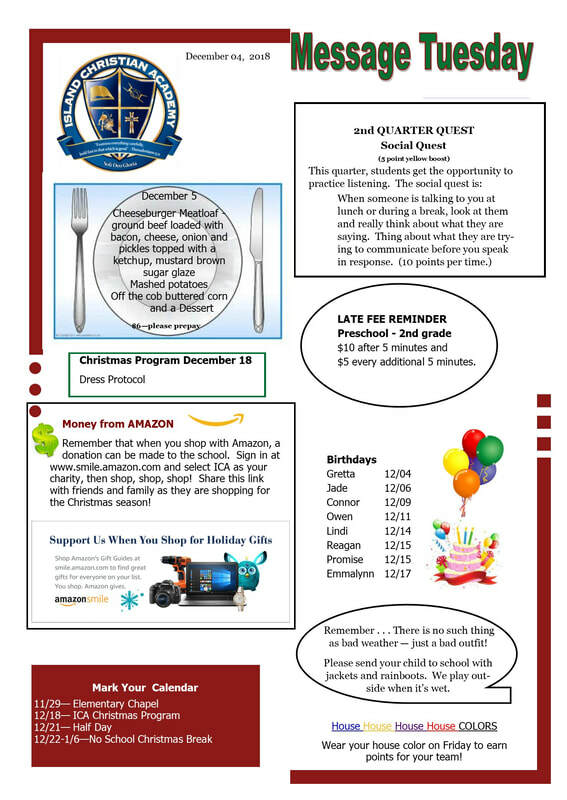 Quest club will be January 24th at 2 pm in the lunchroom. I have attached the last two quests in case you would like to help your student complete them this next week. All quests must be turned in by 3:30 pm January 23rd. 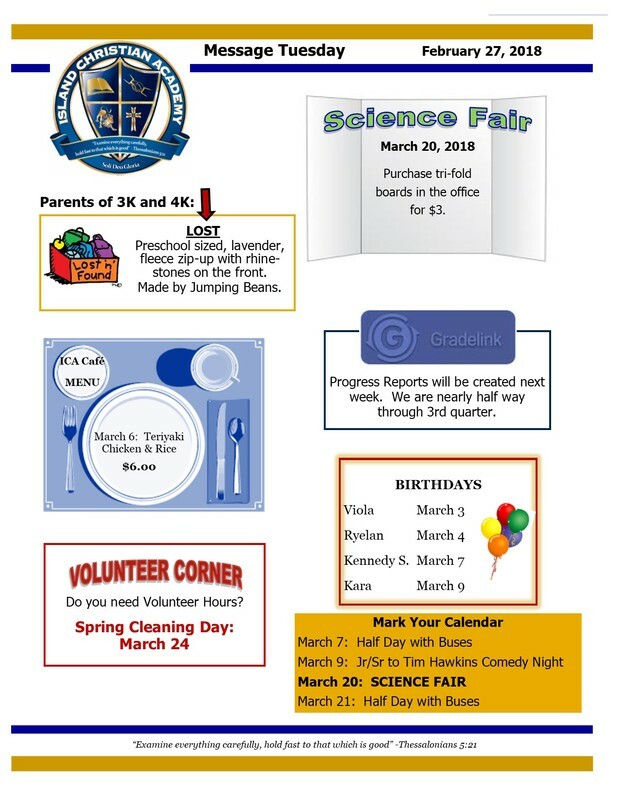 Electives Week: Today is “preview day” when our students in grades three and up get to choose four choices out of 30 classes offered this year! Students will bring home a form this evening for your approval as some of the classes have fees associated. 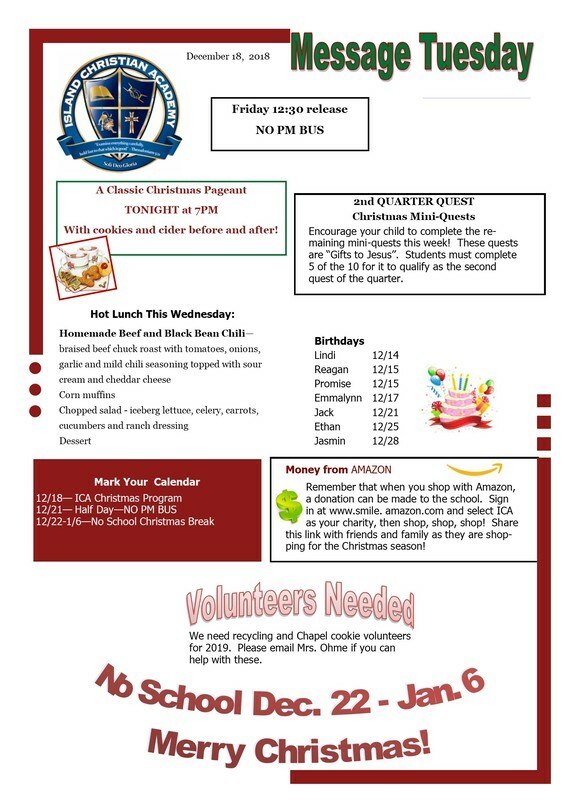 There is also a place on the form to sign up for hot lunches if you would like. 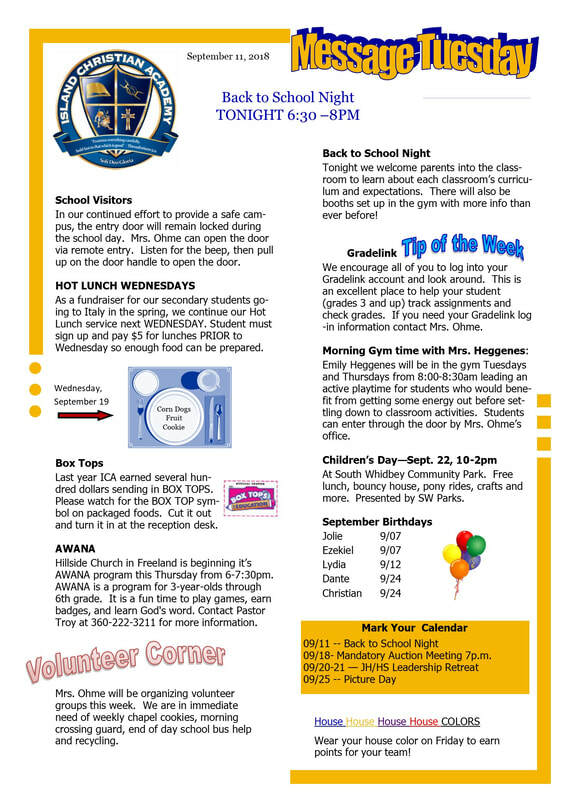 Hot lunch will be served every day during Electives Week. Please return the form by Thursday. Students will participate in these classes January 29th-February 1. 1. 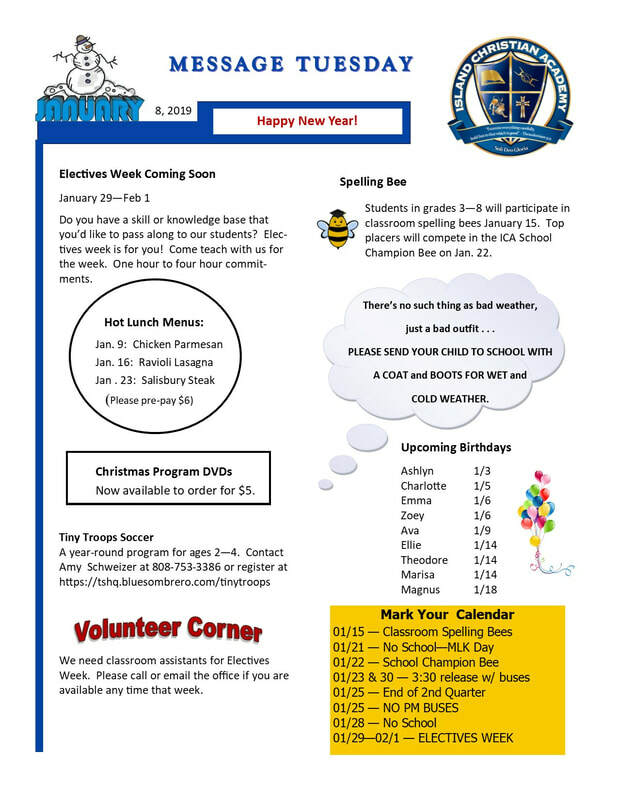 January 23rd and 30th are both Wednesdays that are full days instead of 2:00 release. Buses will run at 3:30. 2. Spelling Bee - The format is a bit different for spelling bee this year. 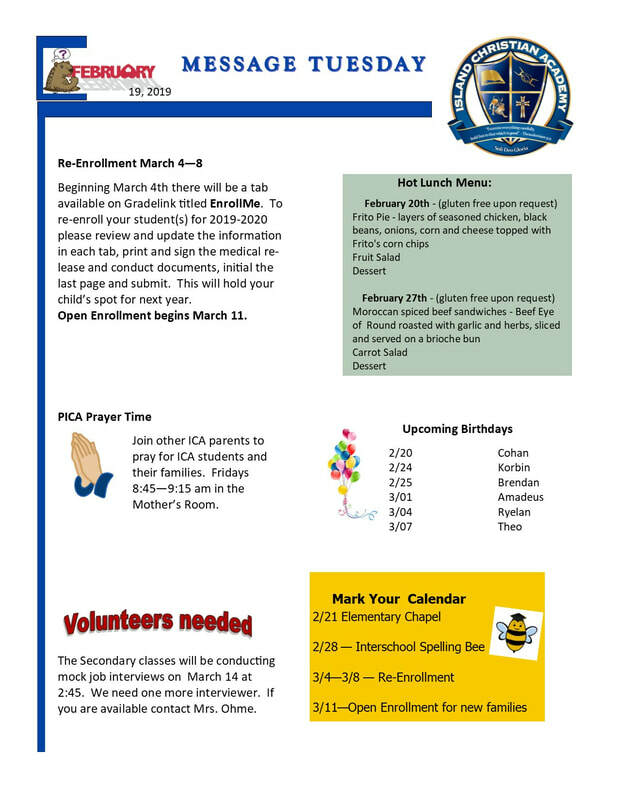 There is more information just below from the coordinator, Mrs. Ronna Bartel. 3. 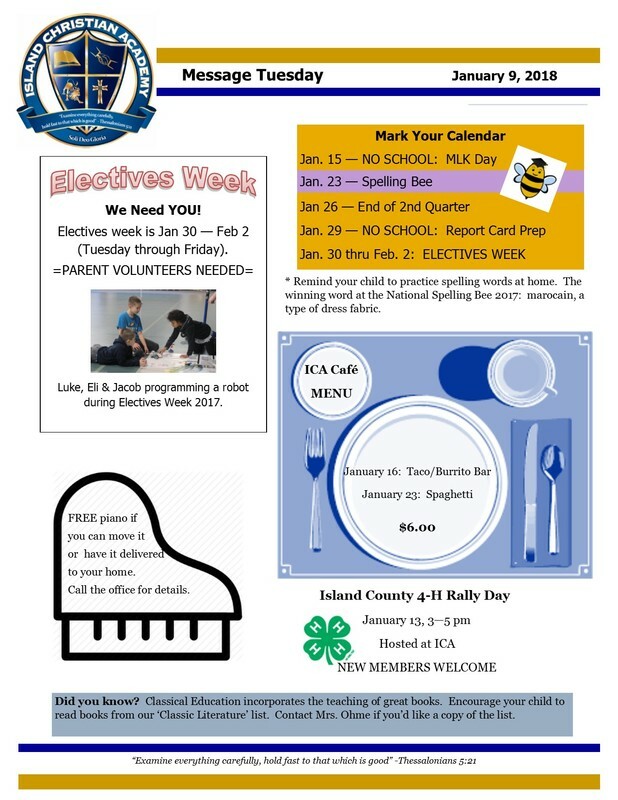 Electives Week - coming up January 29th-February 1st. We have some new class offerings as well as some returning favorites. If you have a skill or hobby you would like to share with our students, please contact the school office. 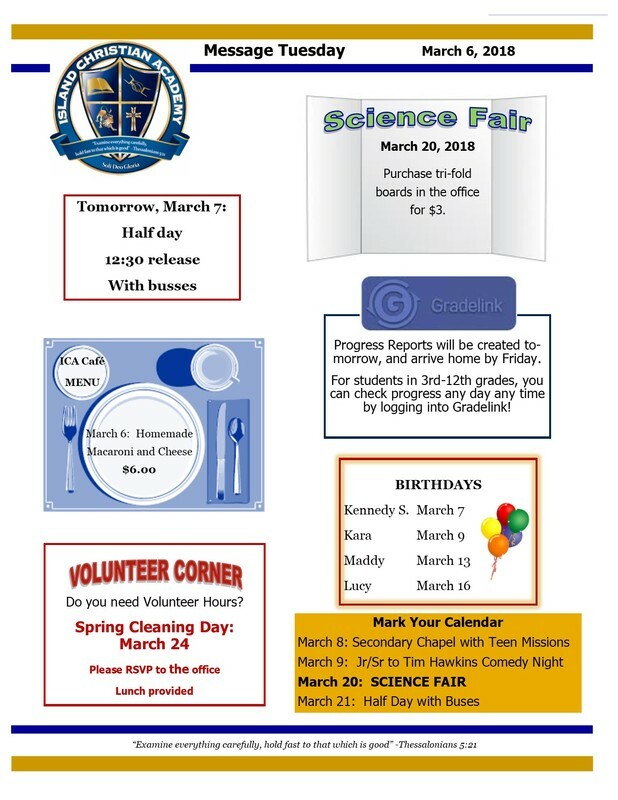 Preview day is next Tuesday when students will have opportunity to choose which four of the 20+ classes in which they would like to participate. They will bring the forms home Tuesday night for parent approval. 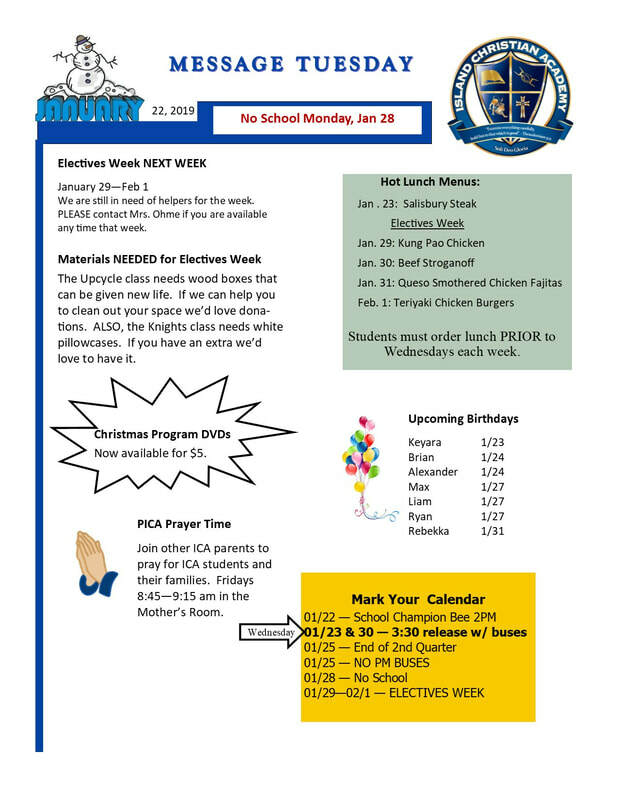 For a more detailed explanation of Electives Week, click here. You are invited to your child's Classroom Spelling Bee next Tuesday, the 15th. The times are as follows: 2nd grade - 9:30; 3rd/4th grade - 10:30; 5th grade - 12:45; 6th grade - 11:15; 7th grade 10:00; 8th grade 10:30. The top two spellers from Grades 2-8 will advance to the All School Bee which is on January 22nd at 2:00 pm in the gym, and to the Inter-School Bee which will be off-Island on February 28th. 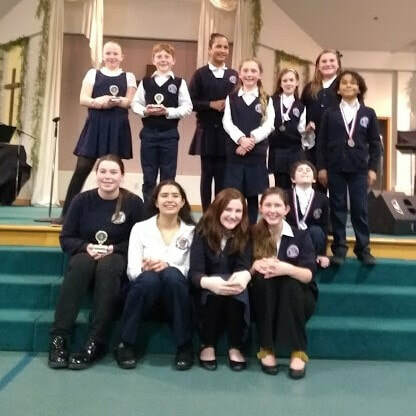 In addition, the top ICA speller will compete at the Regional Bee in March. 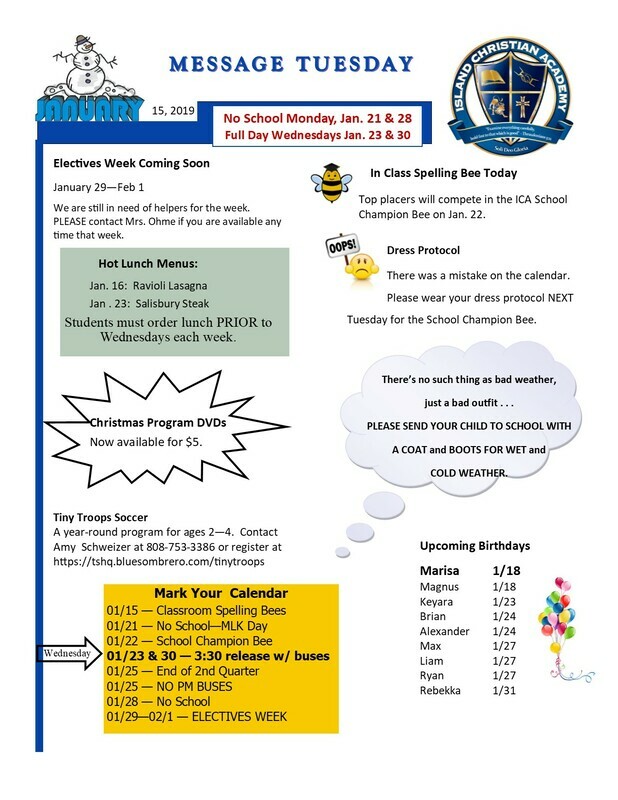 Please continue to have your spellers study their grade level list, and all the words from Grades 1-8 if they hope to compete well at the All School Bee. 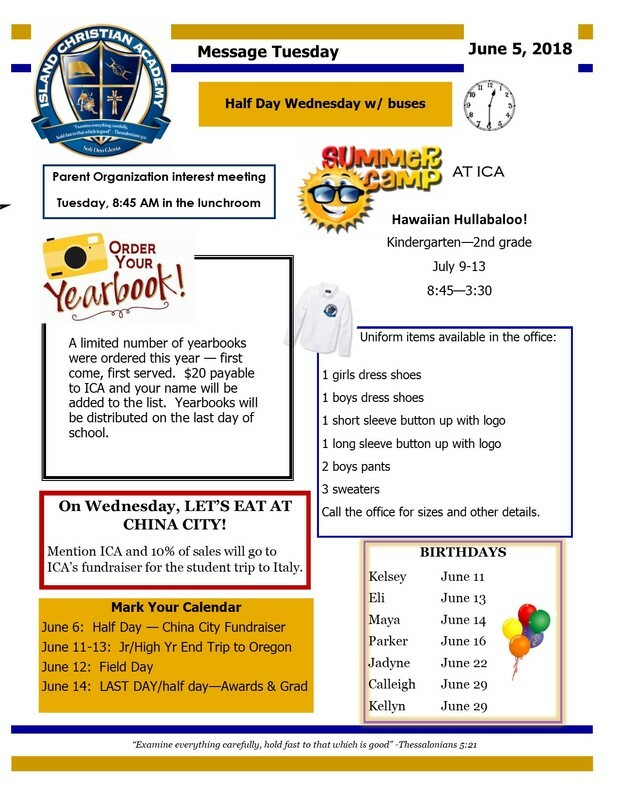 If you are needing another copy of the lists, please contact Mrs. Bartel. Tonight is the annual Classic Christmas Pageant! Although we do the same basic program from year to year, I am always freshly inspired to see talent and personality emerge in new ways. I think you will be delighted by the evening, hopefully have your heart warmed, and be immersed in the purpose and significance of Christmas. 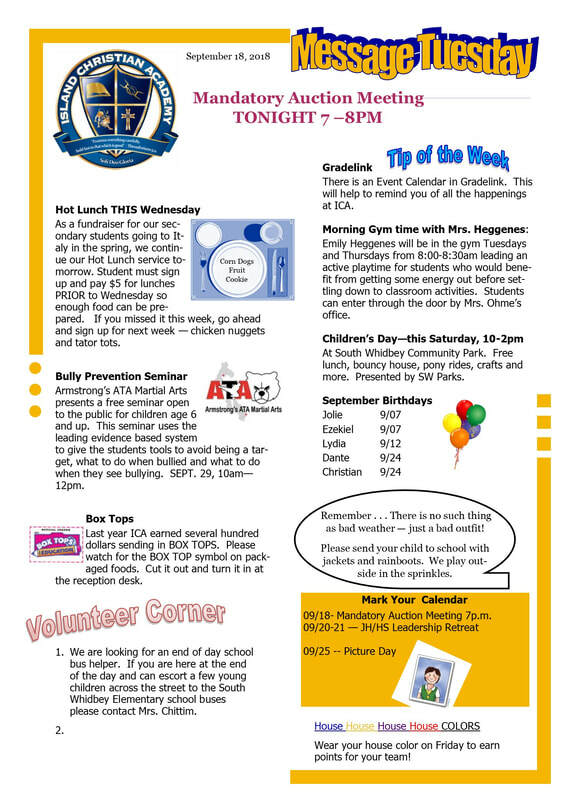 6:30 PICA cider and sweets in the gym for adults (students should go straight to their classroom). Individual students may have additional needs that depend on their costume. Program recording: Someone will be recording the program for our public Facebook page using FB live. We will also record the performance from a higher vantage point and offer it on DVD after the break. Hopefully this will allow you and everyone around you enjoy the program more, and grandparents who aren't able to be here may have a chance to view it. The big news is the Christmas pageant for which we are rehearsing several days this week. Today we bring out the bells! Ever now and then I'll hear a student in the restroom or going down the hall humming or singing part of the Hallelujah Chorus. What a great time of the year! 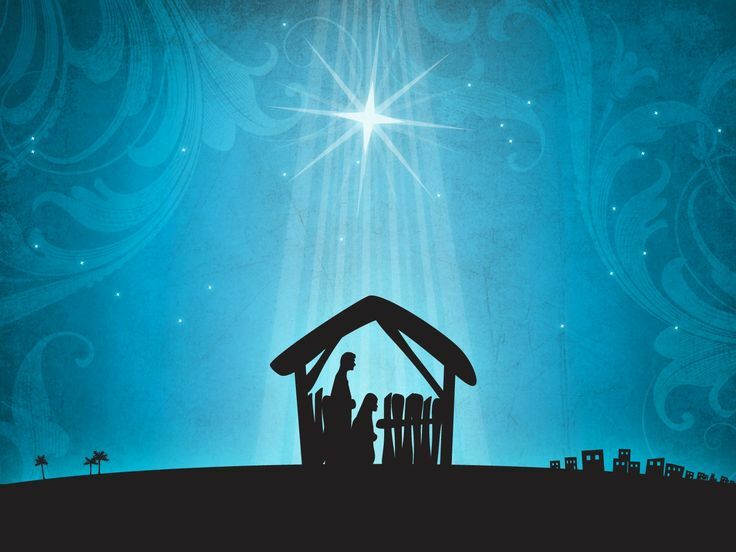 Next Tuesday at 7 pm, we will be meeting in the gym to celebrate the birth of the Christ child. Each teacher will let you know the proper arrival time for your student (most should plan to arrive around 6:30). 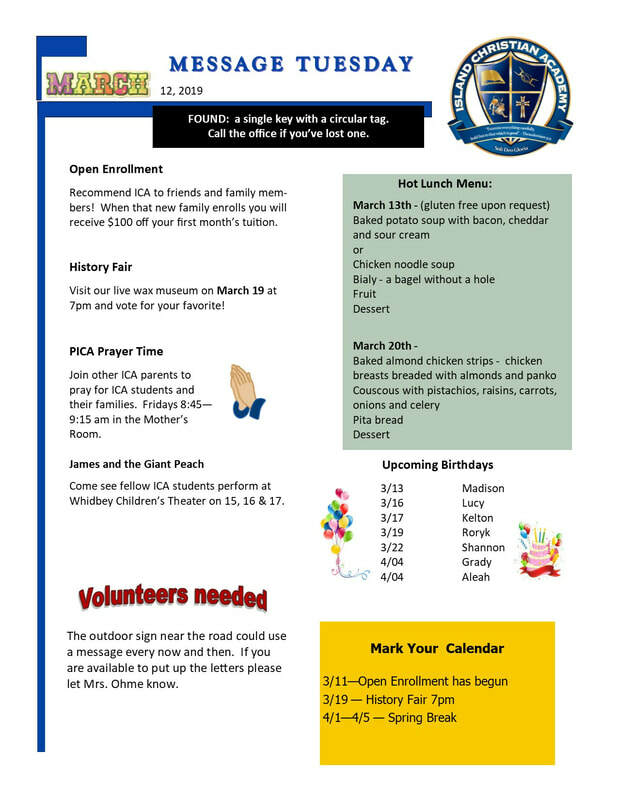 This year PICA (Parents of ICA students) will be hosting a time to chat with cider and goodies at 6:30! 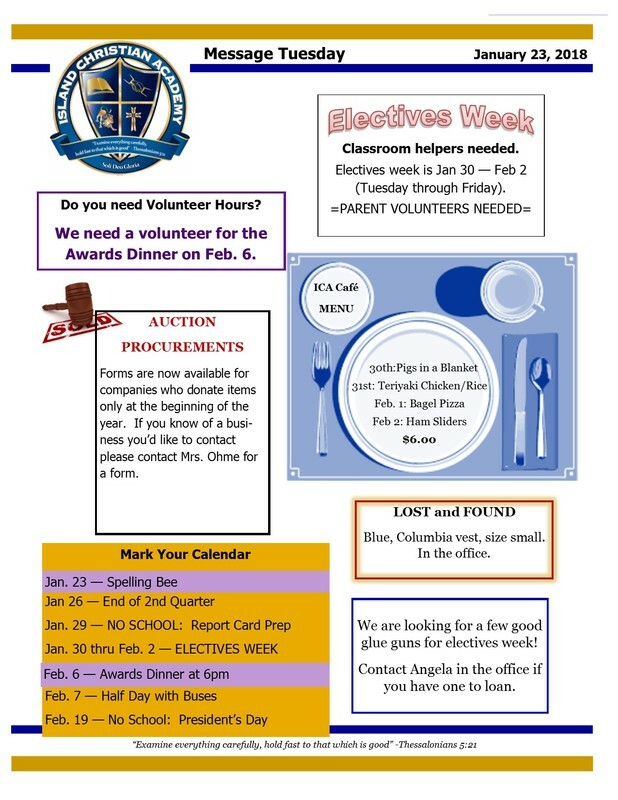 The next big event of the new year, second only to the school Spelling Bee (January 22nd), is Electives Week (Jan 29 - Feb 1), The purpose of Electives Week is to present our students with opportunities and experiences they may not get in the regular classroom setting. Our hope is that some may show an affinity or aptitude toward one or more of the skills or ideas presented and be inspired to learn more independently. I am currently seeking parents and community members who have a skill or particular knowledge in a hands-on subject area which they might be able to pass on to the next generation. I've attached the information for prospective presenters. Please feel free to pass the information on to someone who may fit the bill. Please send any ideas my way! Every now and then you may hear something from your student(s) about houses, quests, or quest club. I thought it might be helpful to use this forum to paint a picture of the idea behind and this year’s iteration of the ICA house system. House operations tend to be part of the background of what we do at ICA, but I don’t want it to be vague, so read on if your interest is piqued. Houses are intended to encourage virtue and life skills that are important, but challenging to acquire in the average student’s day to day life as they are not always modeled in the broader culture. At ICA we feel like who you are is just as important as what you know, and this is one way we can support families in the effort to nurture the character qualities and skills needed for life. It is not a teacher directed program, but is entirely left up to the initiative of the student and/or parents (especially at a younger age). Houses meet together a few times a year for games or to interact as a house and encourage one another to support the team. Each quarter all students are invited (but not required) to join in four different quests. A new quest is presented every two weeks in chapels and/or at our Monday morning and Friday afternoon all-school gatherings. Each quarter a challenge is presented that emphasizes development in the social, physical, spiritual and mental realms. Each challenge is assigned a point value, and each quarter a 5 point “boost” is given to one of the four quests for each house. So, for instance, this quarter the first quest is a social quest worth up to 100 points with a yellow house boost. Every student can earn up to 100 points, but the yellow house members who choose to do this quest get five extra points. Every house has a boost every quarter. 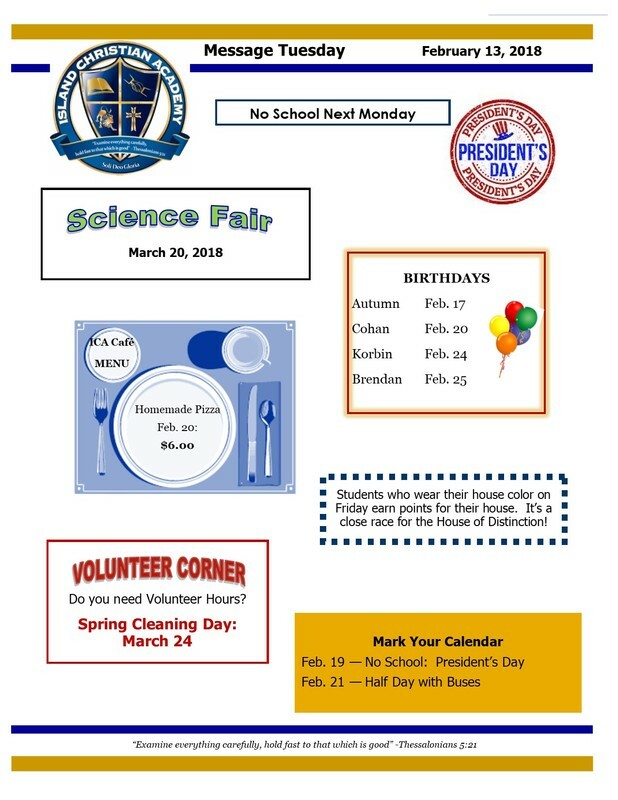 Academics: each quarter students earn house points by their placement on honor roll with varying points for the levels reached. Above and Beyond: Some teachers assign extra activities that go beyond the normal requirements of an assignment, giving students an incentive to excel if they choose. 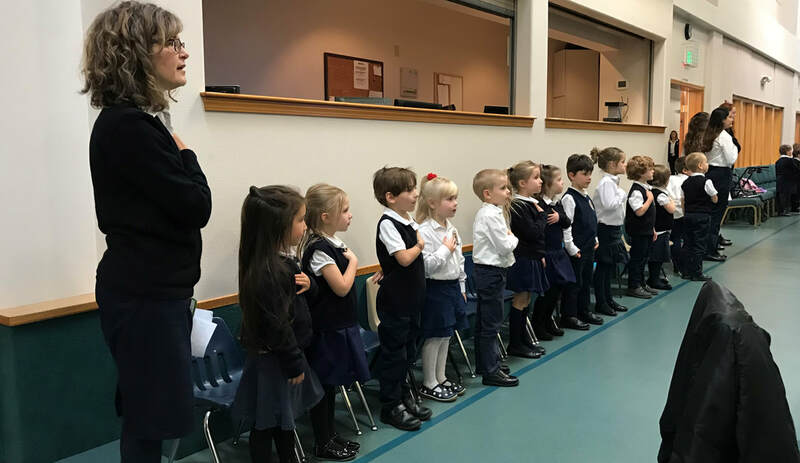 Chapel Awards: Each time we have chapel, the elementary teachers pass out awards to students whom they have noticed exhibiting desirable character qualities. We try to be sure every student is noticed throughout the year. This helps other students understand desirable qualities for an ICA student, hopefully encouraging them to emulate that behavior. Each chapel award earns 10 house points. Friday house colors: Students who wear a shirt that represents the color of their house earns 10 house points. It doesn’t have to be an official house shirt, just the house color. House awards: Points add up for the individual, and cumulatively for his or her house. Two individual house awards are given quarterly. The first is the “Head of House” award given to the student in that house earning the most individual points. The “Go-Give” award is given to a student from any house who exhibits the virtue attached to a specific house. These are usually selected by staff, but occasionally given by an entire house to someone outside their house. Readers of the Round Table: The last two years the Readers of the Round Table was a very visible piece of our house points system. This year it is more in the background, but still a valid way to earn credit. We have a list of classic books organized by reading level we think all students should read during their school career. In order to encourage students to engage with these books, we have offered house points for reading them. We haven’t featured this program with the students yet this school year, but it is available for those who would like to participate. 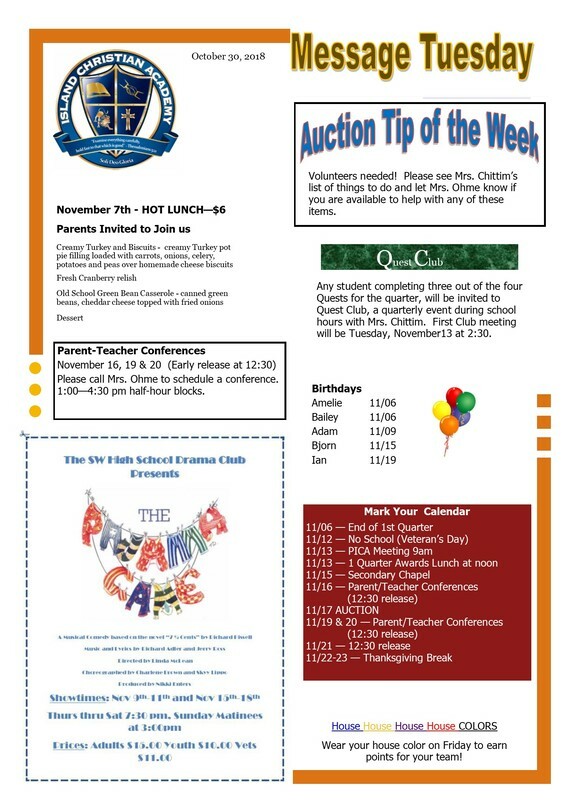 Quest Club: This year, as further incentive to participate in houses, we initiated the Quest Club. This is a quarterly “club” attended by every student who successfully completes at least three of the four quarterly quests during that quarter. The first quarter club was attended by about 15 students during the last hour of the last day of the first quarter. At the club we presented a couple of different scenarios students may face from time to time. As a group we talked through and practiced the protocol related to those events. One was receiving and opening gifts. The principle was that gifts are not about things but about relationships. The saying we learned was “people are more important than things”. Each student was able to practice by opening a gift they may or may not like, and then found something to say that would be appropriate even if it wasn’t a gift they really would use (which some weren’t). It was a fun way to reinforce manners that are already being taught at home. House of Distinction: Each year the house that collects the most points receives the title of “House of Distinction” for the following year. 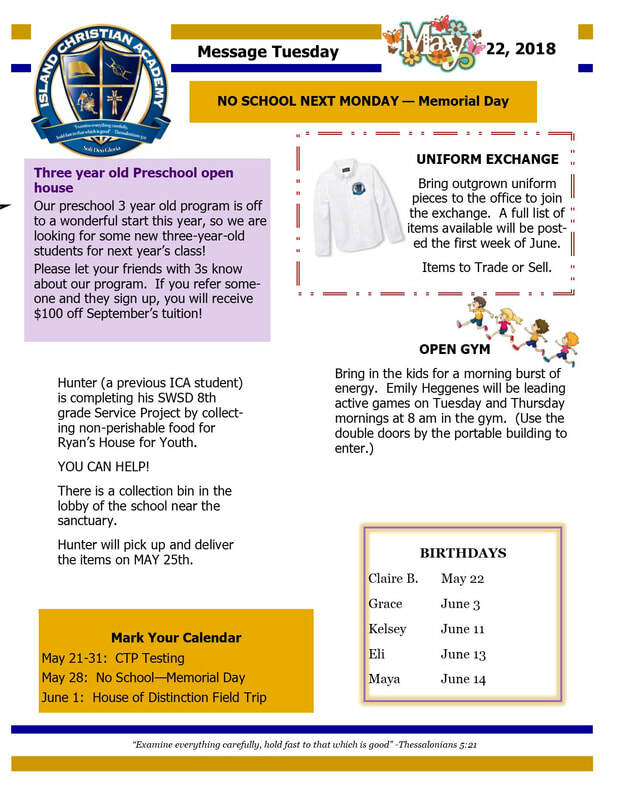 As a reward, they participate in their own house field trip in early June. That was long! I want you to have the knowledge and terminology to help your student fully benefit from the house system if you choose to do so. This is the last time I'll mention auction for a few months. Since last week was a bit premature to give numbers, I thought you all might like o know it looks like our total for this year's auction even with expenses accounted for has now surpassed $64,000. I had to double check the report before typing that just to convince myself I had it right. All I can say is, "wow", and "God is faithful!" Thank you for taking part in that miracle. As of tomorrow, we have completed 25% of our school days for this year! End of first quarter. 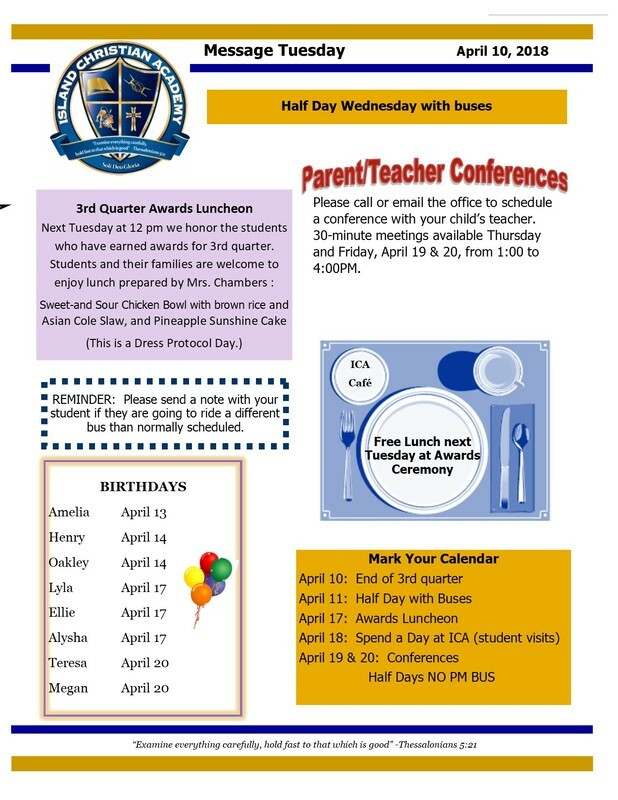 Next Tuesday we invite parents who are able to join us at 12:00 pm for hot lunch and quarterly awards celebration. Parent/Teacher conferences: Teachers and staff now have a feel for the individual students in their classrooms, and would like to sit down and chat with you about ways we can work together to see your student get the greatest possible benefit from their time at ICA this year. Please call the office to schedule your conference. We would like to connect with at least one parent for every student. (The preschool conferences are optional.) The days set aside for conferences are next Friday, the 16th, Monday and Tuesday, the 19th and 20th from 1:00-4:30. Thank you for making this a priority. 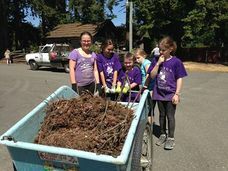 Auction volunteers requested: As we come into the final stretch toward this year's auction, there are a number of jobs that, when divided among many, will be light work. Many of these can be completed at home. All count toward your volunteer hours for the school year. Please email or call Angela if you would like to claim one! Create displays for experiences being auctioned. Next week either Thursday or Friday we will need a few people who are comfortable on ladders to help put up some stage decorations. 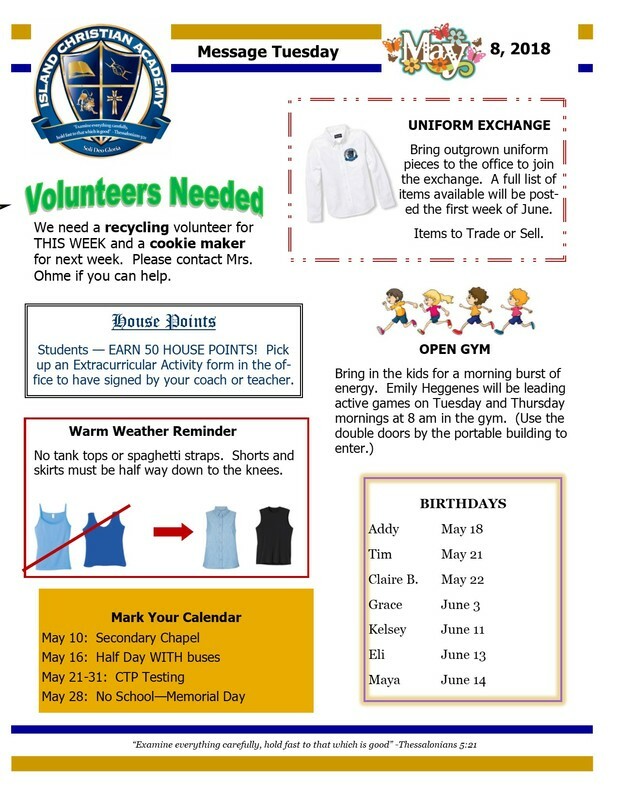 Please email or call Mrs. Chittim if you think you could help. Thank you for bringing in your items and ticket stubs this week. If you have not yet accomplished this, please do so ASAP. Two Day Fishing Trip on the North Olympic Peninsula. Your choice of Coho/Chinook salmon or wild steelhead (catch and release). Stop by the reception area for more details. Financial award: In case you didn’t know yet, Ben Criswell and Eagle Construction have agreed to pay $250 toward tuition for the family with the highest procurement total! We will name the winner November 13th in Message Tuesday. 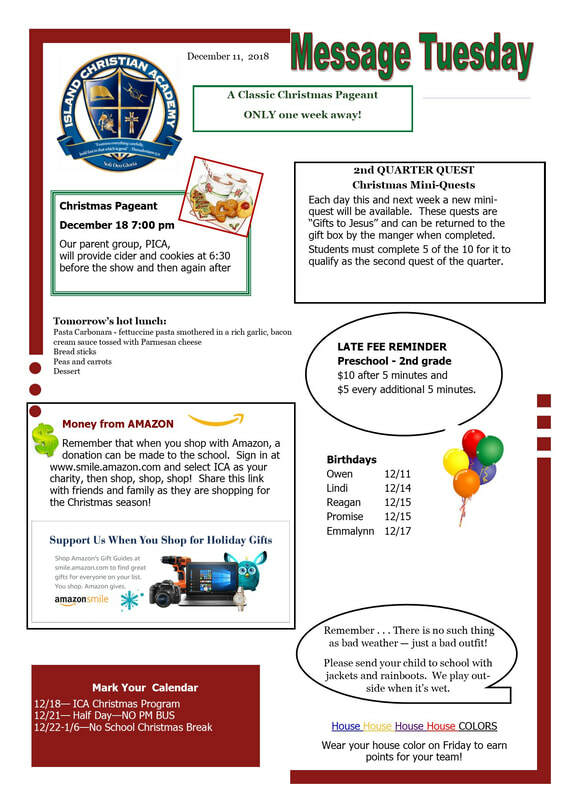 November 5th (This coming Monday): : Please have all procurement forms, items, and ticket stubs submitted to the office. Exception: If the items are unusually large, they could be delivered the week of auction. 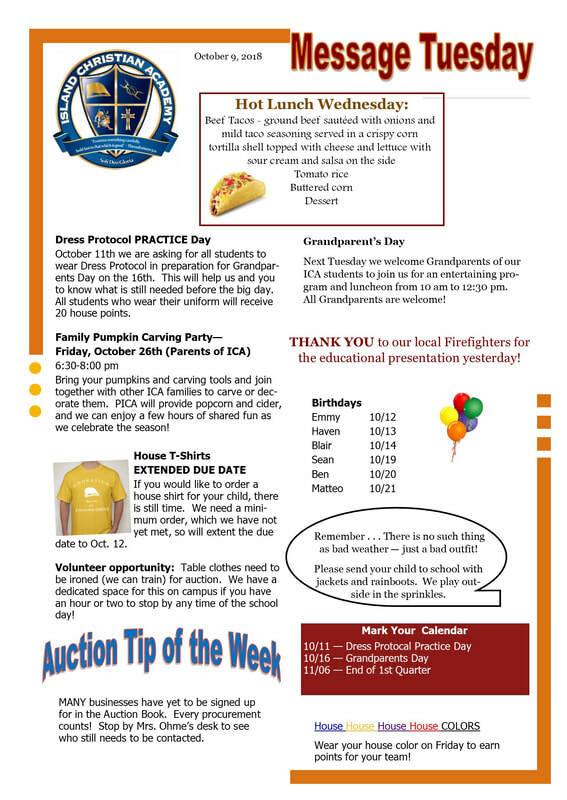 November 5th Last day to be included in the catalog or live auction. We put all the donors’ names in the catalog, so if your form isn’t submitted, your donor will be left out. November 14th: Last day to be included in the auction. Any submissions after this date will welcomed, but sold in another venue. 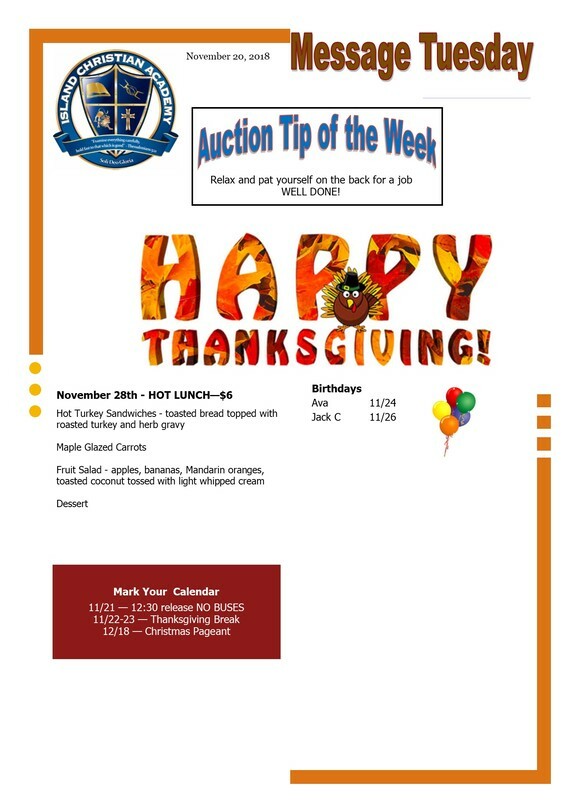 Kitchen crew needs helpers in the days leading up to and day of auction. Email me (Brenda) for times. Clean up crew is still a bit anemic. Ironing seems to be a fading art form, but I am willing to train you! This is the only job that can be done anytime YOU want to do it! We have a room dedicated to the ironing party. Item preview: Sometimes it helps to know some of the larger items that will be sold in advance so you could possibly be better prepared to bid. One of those items this year that has come in recently is a DeWalt double bevel sliding compound miter saw valued at $700. You can see it in the copy room behind the reception area if you would like to take a peek. Please thank our amazing neighbors at Sebo’s for their generous donation! Mariner’s “view level” tickets (4) to a home game! ​Thanks for any part you have in making this a fantastic event that makes the mission of ICA possible! We are in a season of the year that it seems all Christian families navigate a bit differently, specifically regarding how they celebrate, or don’t celebrate Halloween. Opinions and practices vary widely among the families in our school. Overall our desire is to create an environment where we honor the true, good and beautiful, which also guides how we cross the sometimes-murky waters of Halloween season. As an organization, we try to place emphasis on celebrating the harvest season, as American Christians have done for many generations. The key hymn we are singing this month is Great is Thy Faithfulness, which reminds of God’s unchanging nature and the way He provides for us in every season. 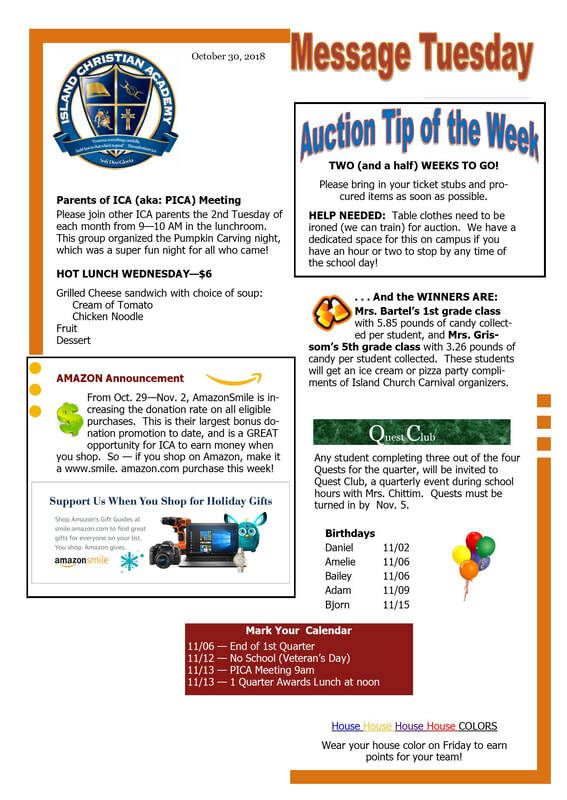 We also have a candy-raiser to support the Harvest Carnival put on each year by Island Church, where many of our students participate in the celebration in a God-honoring way. 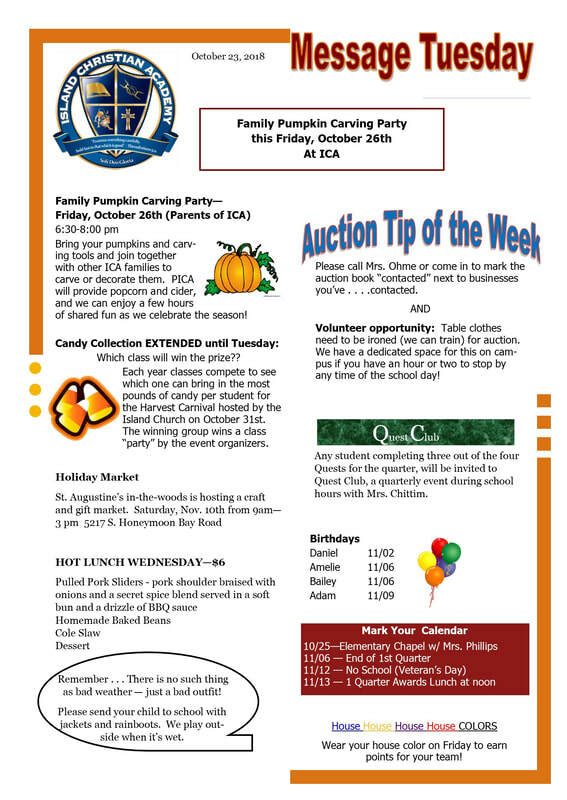 This Friday the Parents of ICA organization is also sponsoring a Pumpkin Carving/decorating party as a way to connect families of ICA students. Some of the younger classes also celebrate the harvest by having class parties. In the coming week. Some classes will encourage students to dress up for the party (not the whole school day as it can be quite a distraction) in friendly costumes. We ask students to not come dressed in anything that would represent the dark or scary, but take the opportunity to display the true, good and beautiful in creative ways. On another note, I recently ran across a short video by one of my favorite authors on raising children, Dr. James Dobson called Kids Watching Violence. It’s less than two minutes, but serves as a great reminder to guard the hearts of our children. Thanks for taking the time to read today! See below for announcements. 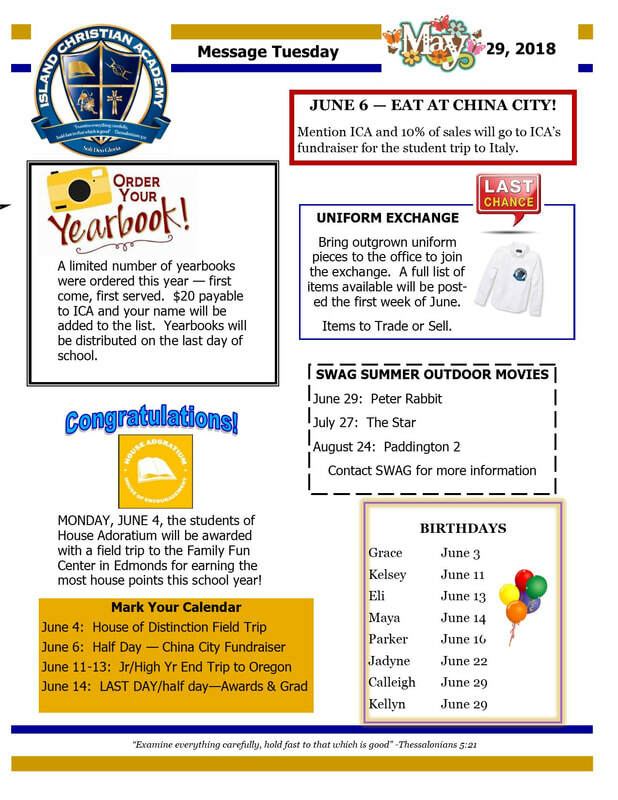 House report: House Auxilium is currently leading the way for the year! 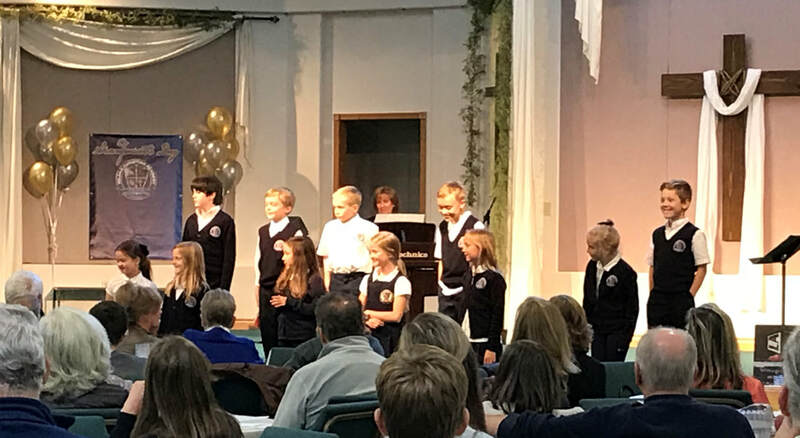 We are thankful for each one of our students who boldly put their ideas forward and gave speeches in their house meetings. We have many students with emerging leadership qualities in our secondary classes, and are very thankful for each one's willingness to serve. Mrs. Wilmoth will be meeting with the group twice a month this year developing their skills, learning to work collaboratively and provide some added interest for all students throughout the school year. 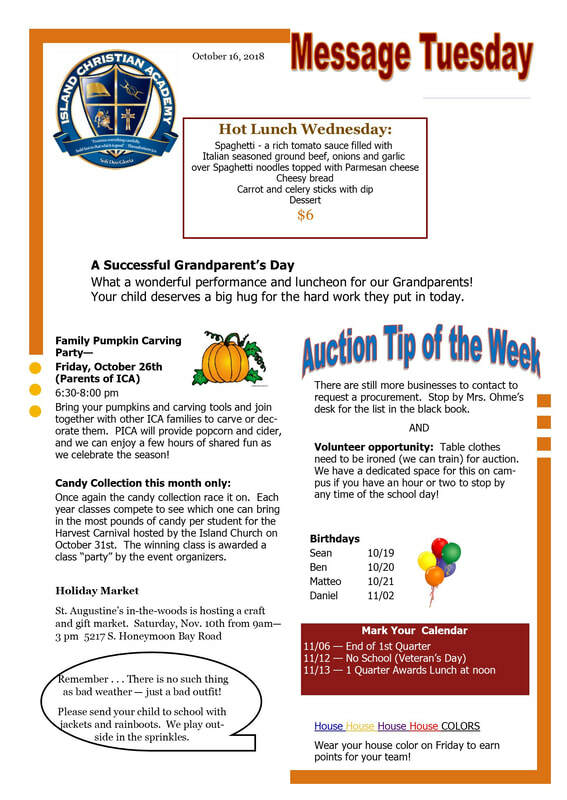 We are looking forward to the well-loved event Grandparent's Day next Tuesday at 10:00 am. Any friend of the student is welcome to come share the day if a grandparent is not available. We even have a few grandparents who would be glad to be adopted for the day if they are needed! 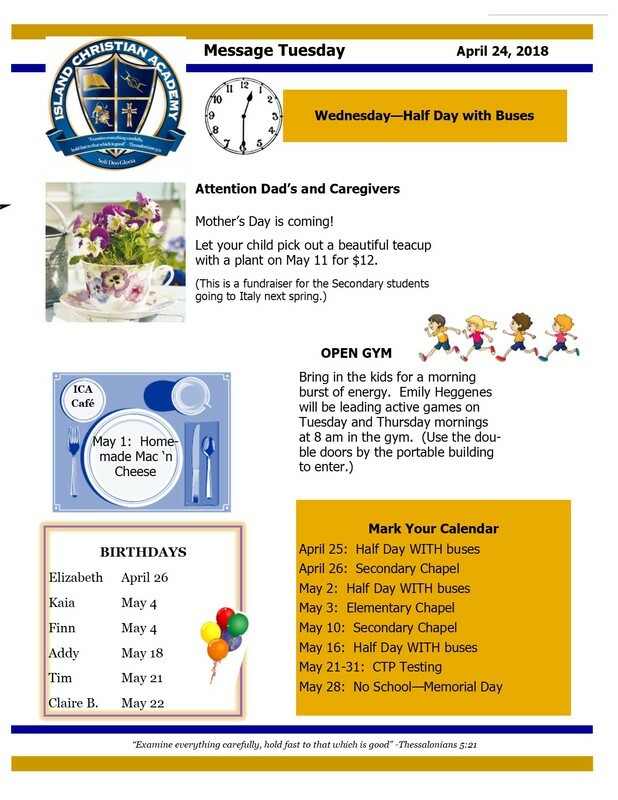 See below for upcoming events and details. Reminder: This Friday there is no school for students, but as a staff we will be traveling to Providence Classical Christian School in Bothell for a regional training event for classical school staff. We'll learn from sessions with titles like Understanding and Communicating with Millennial Parents (I plan to glean some helpful information here), Cultivating a Love of Learning (my personal favorite), Growth and Grit: Developing a Proper Mindset in Our Classrooms in in our Students (If you've ever read Carol Dweck's book called Mindset, this is the classroom application of that insightful teaching). We'll also have opportunity to share lunch with our counterparts in other classical schools. While we are being students, hopefully you will be able to enjoy some extra time with yours this Friday. See below for some important details about the coming week! Thank you to those who made it to the auction kick-off meeting last Tuesday. Hopefully you were encouraged and inspired to go procuring! I was inspired, myself, and sent out two procurement requests the next day. You may stop reading now if you would like! Please pick up your auction packet in the reception area of the school. If you have not picked it up by the end of September, we will assume you would rather opt out. Anyone is welcome to this option. Just let us know and we’ll bill you an extra $1000 per family of tuition over the next 9 months. You are required to procure items and/or services with a minimum value of $800. The amount you do not procure will be added to your tuition bill following auction. 1. 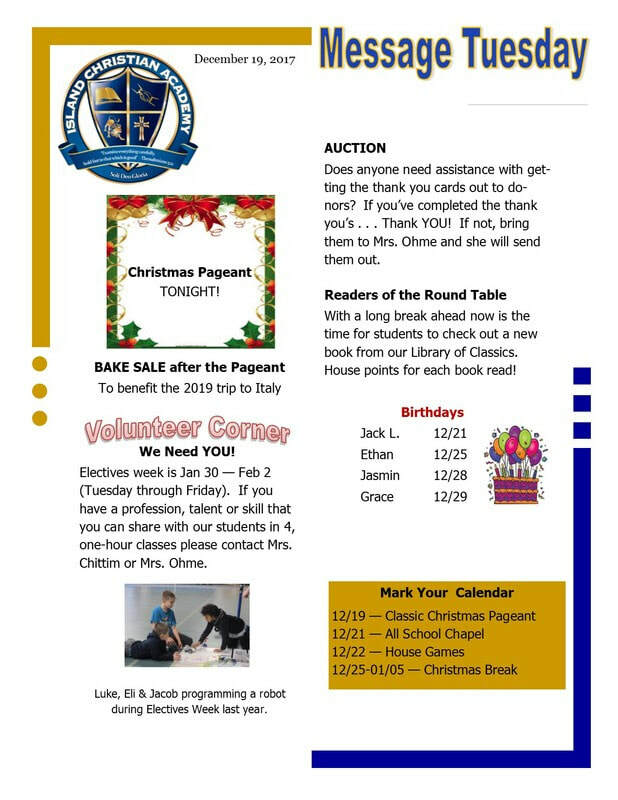 You may sign up for businesses from whom you would like to request a donation in the book in the school reception area. It is very important that you NOT procure from a business you did not sign up for. ALWAYS check the book before asking. 2. You have 2 weeks to visit a business to ask for a procurement. Please stop by the reception desk or call or email Angela to put a yes or no in the book. That way we know that business has been covered and no one else may talk to them. If you have not requested a donation after two weeks, someone else may visit that business. There are a few more thoughts on procurements below. Your packet contains four tickets that are your responsibility to sell. You are welcome to purchase them yourself and bring a few friends or sell them to people who would be amenable to our cause. Please strategically invite people you know would help us in our fundraising effort. You can always get more tickets from the office if needed. Some families opt to purchase a reserved table for $200 (see procurement form), and invite six extra friends! (This represents a $10/ticket savings). Please turn in the ticket stubs with names as soon as possible. Auction is an event that requires “all hands on deck”. 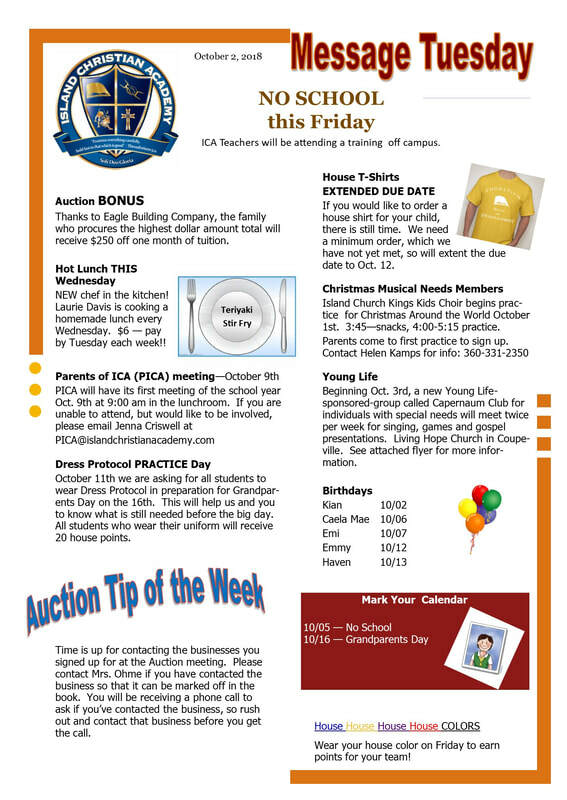 Please sign up at the reception area for an auction or pre-auction job! We need people in a variety of jobs before, during and after auction. 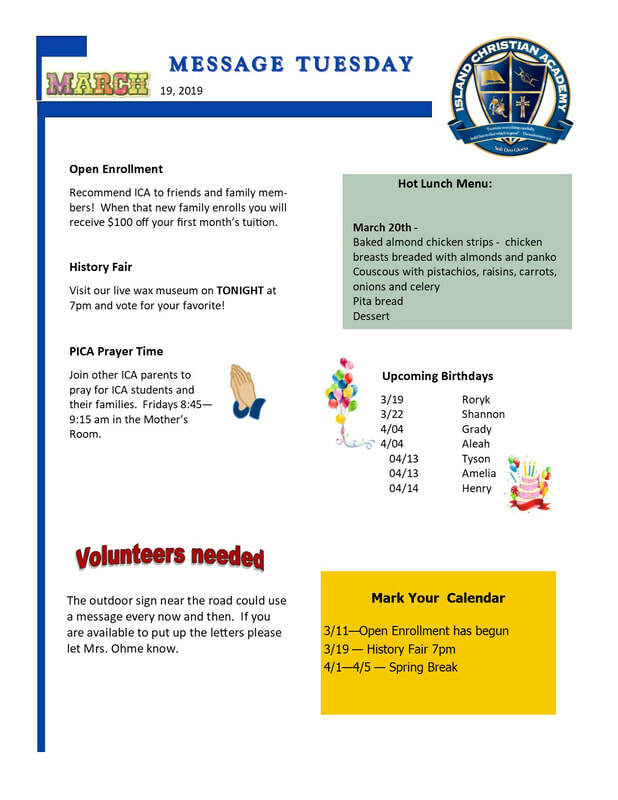 It’s a great way to meet other ICA parents! Think not quantity – usually more than two of the same item will result in the items being sold at less than their value. Cash donation is better than going out and buying items specifically to sell. 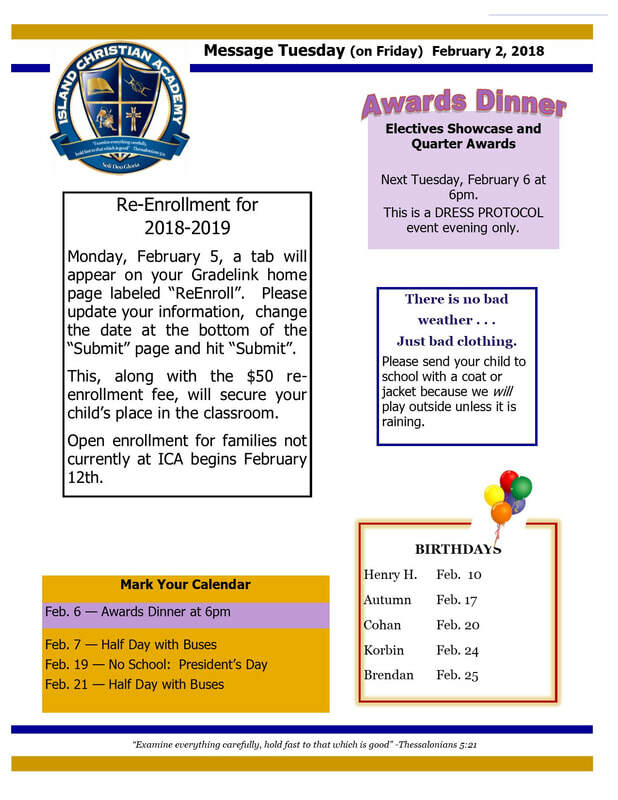 Donations: We have premade invitations you may wish to mail to friends on and off the island which include an option to send a cash donation if they did not wish to attend. Any donation counts toward your procurement total (as long as your name is on the donation). We ask that you please turn in items as you procure them – much easier to record as we go. Procrastination is not recommended. Advertisement form – Sometimes businesses will pay to advertise in our book. Can pick up forms at the reception area. The reward: Eagle Building will pay $250 toward tuition for the family with the highest procurement total! You can do it! Thank you so much for joining in to raise money to keep tuition affordable for families on South Whidbey! Week one accomplished! It seems everyone is settling in to the new school environment, and I believe we are poised for another delightful year of exploring God’s world together as a school community. This evening you have opportunity to hear the teachers’ heart for their students this year. We have been blessed with a stellar staff who are both competent and caring. Thank you for entrusting us with your child(ren) this year. 7:00-7:30. Q&A with teachers and/or check out the displays In the gym. There is even opportunity to win a prize or two! Both classroom presentations are the same. They are repeated for families who may have more than one student in the school. If you are missing any enrollment paperwork, please bring that along with you tonight. 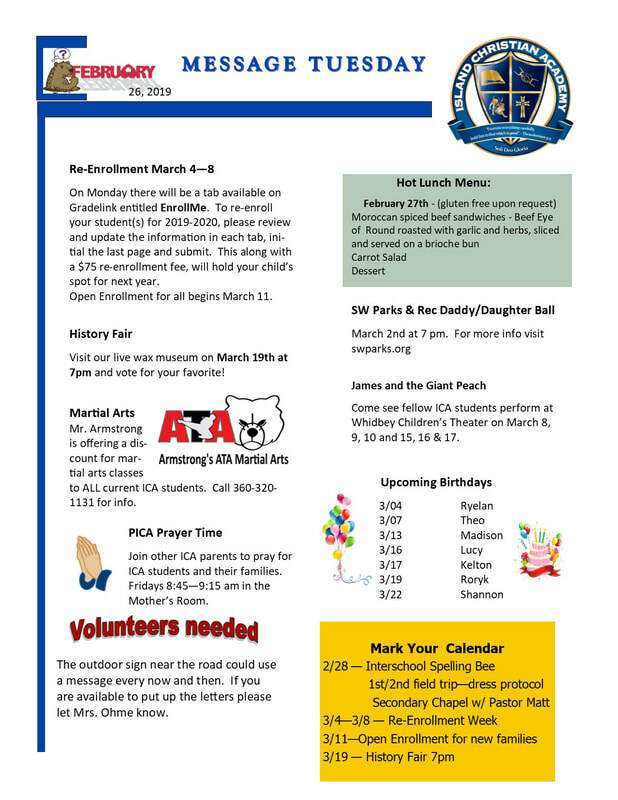 See the flyer below for several additional announcements. I hope to see you this evening!